We wanted to spotlight a very special pair of Ettore Sottsass Memphis Design Group earrings produced by Acme Studios in 1985. Titled "Fulmine", which means "Lightning" in Italian, these earrings have a very distinct architectural quality. The center leg of each earring depicts the Fulmine or lightning bolt as it travels from the heavens to it's contact point. 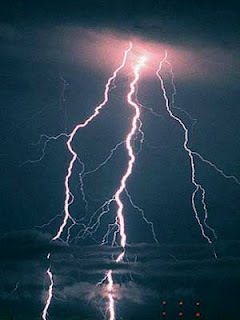 The center lightning leg is a soft pink color with bright orange shapes at the ends. The structural design is bordered with blue support columns and is capped with a white ceiling of clouds at the top. Each of the earrings measure 1.5" tall by 1.25" wide. 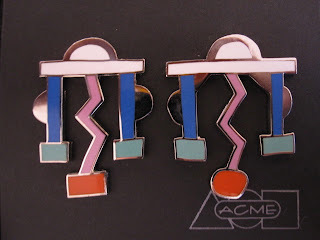 These original Ettore Sottsass Memphis "Fulmine" Earrings are currently available for $150. We love how Ettore's playful design builds on the electric quality of the Memphis Design Group.